My yard dandelions and I have a friendly agreement. They don’t take over too much of the yard, and I mostly leave them alone. Somehow, they seem to forget this understanding every spring. I like to think it’s really all those naughty dandelions from two yards over – they just keep sending their seeds over and settling in like they own the place. My dandelions would never do such a thing. As soon as it gets warm enough, yellow blossoms riot all over the grass – I’m not sure if we can even properly call it a “lawn” – but whatever. At some point, I track down my fulcrum weed digger (that is the proper name for it, even though I like to call it the stick digger thingy) from wherever it has gotten to. (This year it was on top of a bunch of bark I’d collected for a craft project, you can tell how serious I am about sustained weeding!) Then I spend a few days laboriously crawling around on my knees to each plant, snapping the tap-root with the digger and throwing the weeds into a pile. 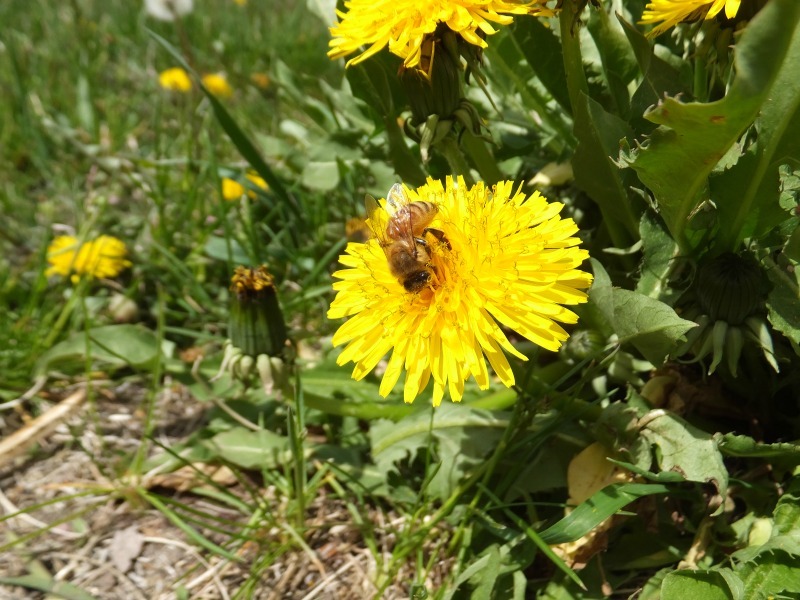 Dandelions are actually really awesome for naturally aerating soil and are one of the first foods that honey bees are able to obtain in spring… so my working lawn care plan is this; In spring, I dig up the dandelions that are huge and suffocating, actively blooming and/or those that are starting to go to seed. Then I ignore them for the rest of the summer. Obviously, weeding is a process that takes some time and it happens when it’s warm enough for other flowers to be blooming – so the bees have a few days to make the most of the golden trove and then find other food sources. I am not especially fastidious about yanking every last weed out of the yard. (Unless it’s Yellow Goatsbeard or Bindweed, that stuff has to go.) My goal is just to remove the initial crop so that there is space to run and play without the danger of stepping barefooted on bees and so that the yard is a giant cloud puff. This process makes sense to me. And weirdly, it does seem to work. I apparently have a fondness for masochistic yard care tactics. (Just ask the Engineer about manually removing several hundred feet of river rock and gravel “landscaping” put in by the previous owners of this house.) The dandelions have just as much right to exist in this space as I do and using a herbicide feels like cheating. (I wouldn’t use ’em for lots of other reasons anyway.) If I want to reclaim green space for just grass, I should go at it mano a man… er… womano a dandelieo. Love your approach.although I umm…don’t garden.. I really can’t …allergic to most of the world… it was not pretty when I mowed once… Once that is all I have ever been able to do and even then It only lasted about ten minutes. I itch just thinking about it. I just don’t see dandelions as a weed like a lot of people do. I see wishes! But stepping on bees is bad too. My little boy agrees with you… for every dandelion I pull out, he’s blown a puffball and spread a gajillion more. I don’t mind. I’m sorry that you’re so allergic – I’ve got seasonal allergies and those are bad enough! I actually think dandelions are very pretty. It’s the dollar weeds that I can’t stand! 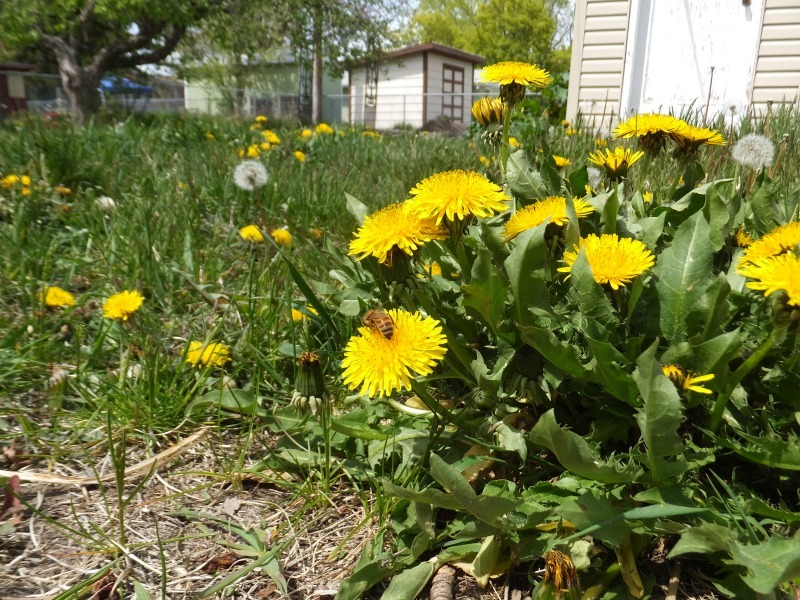 Hahaha, I love how you say ‘weeds are unwanted flowers!” Unfortunately, I am one of those people who has come to dislike dandelions, and we have a TON in our yard. I also have a “stick digger thingy” that I break out in moments of OCD-like-weed-clearing. *laugh* Oh man, well, I’m sure lots of other people would think bindweed is pretty (and it is, looks just like morning glories!) but I hate the stuff! And no, I’m not judging you on your dandelion dislike! Mine is blissfully almost yellow free for the moment, and I’m enjoying it!